Switching to smaller jobs is easy with the Speedrooter XL. Just loosen the three knobs‚ tilt the motor back‚ and lift off the drum. Switch to 1/2" cable drum in less than a minute. The power feed drives 3/4"‚ 5/8" and 1/2" cables and has the pulling power to get your cable out of the line even on long‚ tough jobs. 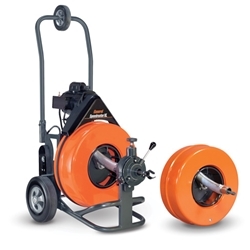 The 20-ft power cord‚ ground fault circuit and pneumatic foot pedal allow for easy operation. Getting to and from the job is simple since the Speedrooter XL has 10" wheels‚ V-belt stair climbers and a handle-mounted loading wheel to help you lift the machine. Includes: 100 ft of 3/4" Flexicore® cable‚ 100 ft of 1/2" cable in small drum and COCS combination cutter set‚ which includes all items in the SRCS-R cutting set plus an arrow head cutter‚ 1-1/2" U-cutter‚ 2" side cutter blades‚ small retrieving tool and 13" flexible leader. SRCS-R includes a 26" flexible leader‚ spear head‚ 3" and 4" side cutter blades‚ 2" "U" cutter‚ 3" and 4" rotary saw blade and a large retrieving tool.